The Explorers: They are off!! Doug and Jonathan started their adventure in beautiful weather this morning. There were many friends who came out to wish them Bon Voyage. 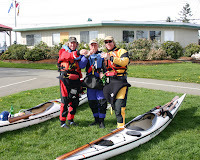 They are joined for the first day by one of their paddling buddies, Brent. That must be some pretty powerful "energy drink", those are small glasses! Ha! I'm so proud of you Daddy!